A group of Necromancers plan to summon an army of zombies. Travel to the ritual site north of Southfringe Sanctum. Find and read the Necromancer's Journal to complete the quest. Once you've installed the Plague of the Dead Creation, you will receive this quest along with an anonymous letter. Read the letter to learn that a group of Necromancers plan to perform an ancient, dangerous summoning ritual to conjure an army of zombies. The ritual site is located high in the mountains southeast of Helgen, just north of Southfringe Sanctum (map). Once you arrive at the ritual site, you will find a group of decomposing zombies standing over the bodies of the slain Necromancers. Clearly the ritual was successful, but the Necromancers lost control of their summoned undead. Defeat the zombies and approach the body of the Necromancer marked by the quest marker. He will be holding Spell Tome: Conjure Foul Zombie as well as a journal. Read the journal to complete the quest and learn of the consequences of the ritual. You can also loot the area for two copies of Spell Tome: Conjure Zombie. Following the conclusion of the quest, you will have a chance to encounter zombie horde world interactions randomly in the wilderness. 10 I've found an urgent anonymous letter. I should read it and see what it's regarding. 20 I've received an anonymous letter asking me to help stop a group of Necromancers who are planning to raise an army of Zombies. I should investigate the ritual site. 40 Finishes quest I found the Necromancer's ritual site, but it's too late. I also found a journal detailing what transpired here. 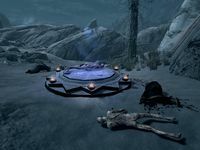 They appear to have already conjured the risen dead, possibly across all of Skyrim. I'll need to be vigilant, especially during the late night hours. On the PC, it is possible to use the console to advance through the quest by entering setstage ccBGSSSE003_ZombieQuestStartEncounter stage, where stage is the number of the stage you wish to complete. It is not possible to un-complete (i.e. go back) quest stages, but it is possible to clear all stages of the quest using resetquest ccBGSSSE003_ZombieQuestStartEncounter.